You can create an application that provides a new IME. You can start the IME application life-cycle, interact with the current IME UI state, and retrieve attributes and events. Once the IME application is started, the Create() event handler is called. When a text input UI control receives focus, the Show() event handler is called. 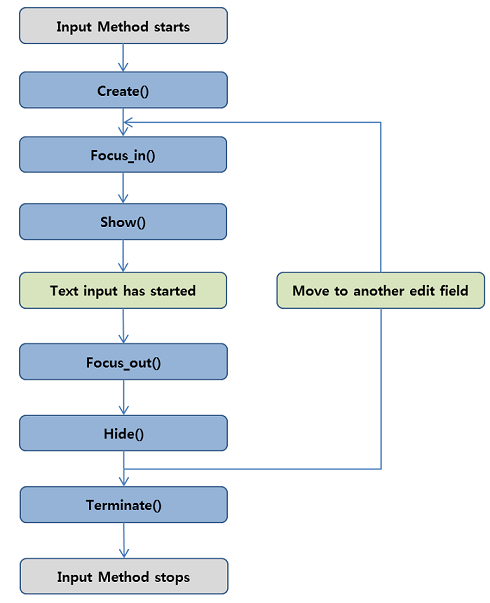 The IME application can call Tizen.Uix.InputMethod methods to interact with the UI control. The event handlers are called when the UI control state changes. When the text input UI control loses focus, the Hide() event handler is called. When the IME application is finished, the Terminate() event handler is called. The IME application must implement the Main() method. It is the main entry point, in which you can register event handlers and call the Run() method of the Tizen.Uix.InputMethod.InputMethodEditor class to start the main loop. During its life-cycle, the IME application can receive a number of events from the Tizen input service framework through the event handlers. You must register the mandatory Create(), Terminate(), Show(), and Hide() event handlers. Other event handlers can be registered as required by the specific IME application. When an associated text input UI control has focus, the active keyboard is shown. When the text input UI control loses focus, the keyboard is hidden. The Show() and Hide() event handlers are used to manage the keyboard visibility, and the IME application must register both of them when starting the IME main loop. The client application can set various configurations for each text input UI control, such as the cursor position, key layout type, return key type, and flags for predictive text. The configurations are delivered to the IME application through the Show() event handler, to allow the keyboard to show the correct appearance to the user. The method is called when the user selects the IME as default from the IME selector menu.